Thanks to the technical skills of longtime Oakland, Calif., supporter David Kaspiak, you can watch the three minute, 30-second KSPN2 News piece by clicking here: KSPN2 News.mp4. 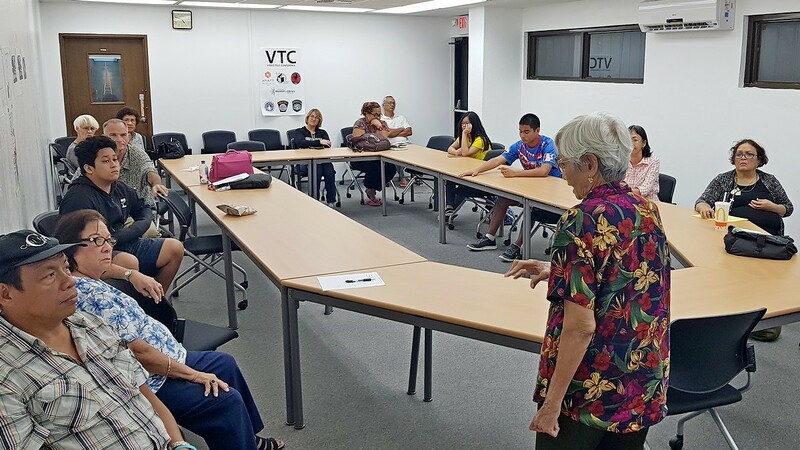 Marie S.C. Castro, standing, the prime mover behind the initiative to build a memorial monument to Amelia Earhart on Saipan, shares her extensive knowledge of the truth about Amelia’s disappearance with a few interested citizens at Saipan’s Joeten-Kiyu Library on Sept. 14. Photo by Junhan B. Todiño. To see the Marianas Variety story, please click here. Among the several fine stories have been published here and in the Marianas Variety on the proposed Earhart Memorial Monument, was “Marie Castro: An iron link to Saipan’s forgotten past,” which appeared in the March 28 Marianas Variety, with a longer version here on April 2,“Marie Castro: Iron link to Saipan’s forgotten history,” in praise of this brave woman whose vision birthed the bold but highly unpopular initiative to build an Earhart memorial on Saipan. But these print-based efforts have done little to improve the ugly politics that surround this movement, which, according to one informed source, are running 99-1 against its success. Undeniably, TV’s power to persuade and change minds is far greater than newspapers or radio, and this interview is a badly needed boost. In attempting to convert even small numbers of the historically ignorant and propagandized on Saipan, only via TV can the truth break through the stone wall of massive resistance. Saipan TV: The Visitors Channel (SaipanTV.com) is clearly not connected with any of the American alphabet networks — ABC, CBS, NBC, CNN, MSNBC or Fox, actually the worst of them all for its blatant hypocrisy — or any other U.S. establishment news source, or this interview with Marie Castro would never have been contemplated, much less have seen air. Unsurprisingly, nobody the United States has touched the story of the proposed Earhart monument on Saipan, which should remind everyone how much the Earhart truth continues to be hated, ignored and denied by our establishment and its media toadies. The news of Josephine Blanco Akiyama’s imminent visit to Saipan was likely an important factor in the decision by the independent station’s management to do the interview with Marie Castro shortly before the most famous of all the Saipan Earhart eyewitnesses returned to her birthplace. Please consider contributing to the proposed Amelia Earhart Memorial Monument. This is a most deserving and worthy cause that has, sadly, been largely ignored. You can make your tax-deductible check payable to: Amelia Earhart Memorial Monument, Inc., and send to AEMMI, c/o Marie S. Castro, P.O. Box 500213, Saipan MP 96950. The monument’s success is 100 percent dependent on private donations, and everyone who gives will receive a letter of appreciation from the Earhart Memorial Committee. Thank you for whatever you can give. Interesting that they plan to put up this monument within the next 6 months. Also that they moved the location from the airport to the old Japanese jail house where Earhart was held. She also describes it as a tourist attraction. Understandable. She compared it to other tourist attractions which are WWII events that took place there. Good marketing on her part. I didn’t want to pour any water on their statement that the monument would be completed in six months, so I didn’t comment on it in the post. Six months is a virtual impossibility, given that only a pittance of the estimated $200,000 necessary for the monument has been raised, not to mention the time it will take to build it. I don’t know where this figure came from, but it’s unrealistic in the extreme, unless something is afoot that being kept from this member of the memorial committee. Quite frankly, I would be happy if I knew for sure that the memorial would be built within my lifetime. We need to *CONGRATULATE Marie & Mike, on their efforts in having this statue erected, on behalf of Amelia Earhart. Nobody else will take the time to do this. I rather look upon a statue of Amelia Earhart, than a jail cell she was imprisoned in. This will, once and for all, be an acknowledgement of her presence & death on Saipan. This monument will be a beacon for the *TRUTH. I think six months is a bit ambitious, but I’m encouraged by Marie’s spirit, drive and enthusiasm. God bless her! She sets the example for us all.